CALL OF DUTY: TACTICAL UNIT. CONSTRUCTION SET. If the item is delayed or loss we will not be able to locate it. Mega Brands, Mega Construx American Girl, FDY98, $69.99, New, Two adventurous choices with this deluxe 2-in-1 building set: Lea's Rainforest Sanctuary, or Lea's Animal Rescue!, Buildable two-story sanctuary or animal rescue shelter, SK-007E2J-001. This set has been opened. 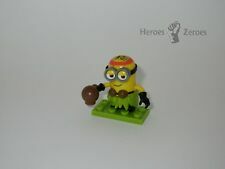 Pictures are of actual item Halo set that you will receive. Swoop into battle with Dartrix! Pokemon Trainers can practice their Flying-type attacks when they soar their way into battle with their very own Dartrix! Ideal for ages 6 and up. Condition: Like new. This service. The combat raiding craft of the RIB Beach Assault is used for clandestine insertion of military personnel on beaches, piers and offshore facilities. 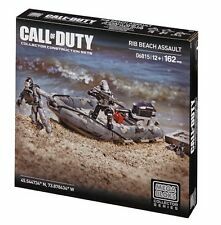 Includes 16 highly detailed, interchangeable accessories and weapons like removable combat vests, ammo pouch, boots and flippers, combat knives, and more! 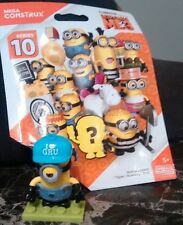 You will get the SECRET Chase - CMinion w/ "I Love GRU" hat on and RARE Chase - Unicorn! Good Luck! Accessories: All accessories displayed in the picture(s) are included. Condition: Like new. This service. This is a complete Sea Wolf Sub with working lights and sound (Installed new batteries to make sure it works well!). This is a bargain for sure. 1 - SpongeBob Karate (Karatay') (Factory Sealed). Labeled with easy to remove, no stick residue label. I cannot be responsible for understanding all countries’ tariffs and/or brokerage fees. SEE ALL PICTURES! Ideal for ages 8 and up Features. Ideal for ages 8 and up Features. There are 80 individual pieces inside as stated on the label. I have shown a closeup of a few for your viewing. The blocks are in various sizes & colors & shapes. The entire box is approx 18" tall & 10" across. Mega Construx Destiny Lion's Vigil Hunter #FMK03 22 Pcs New in Box Condition is New. Shipped with USPS First Class Package (2 to 3 business days). You get all that is photoed. 12 to collect. Item Weight: 8 ounces. Build a friendly bunch of garden critters and learn your shapes! Your little builder can learn all about shapes when they use blocks decorated with different shapes to build a friendly bunch of garden critters! John Deere Lil' Harvest Farm. I like to re-purpose grocery bags as a way to semi-recycle. We do have a dog, a Springer Spaniel who doesnt think he's a dog. Includes buildable Destiny logo display stand. Used. See pics for details. You get what you see in the picture! New Item #1. 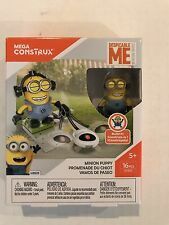 16 PCS Minion Puppy Minions. Lot of 15 Mega Bloks minifigures and a Horse, canoe, weapons and a few other things. Normal wear and tear. All wheels spins good.